Snowboarding prodigy Chloe Kim talks with SI.com's Ryan Wallerson about dealing with fame at 15 years old, her favorite memories of her career so far and much more. At the ripe old age of 15, Chloe Kim is perched squarely atop the world of women’s snowboarding. 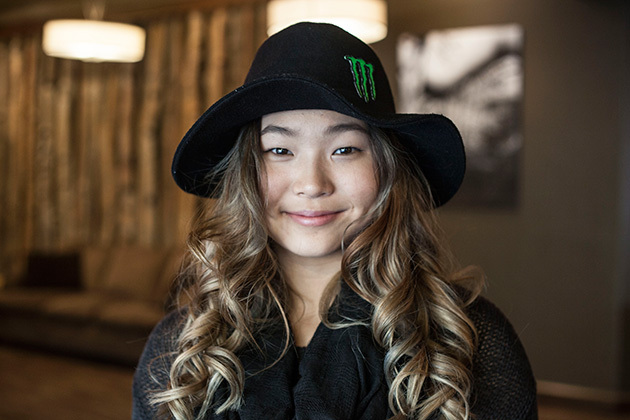 The Korean-Californian teenager has followed up her breakout 2014-15 event season­—she won her first X Games medal and made podiums at almost every big event—with an even better season this winter. Kim won gold medals at both X Games Aspen and Oslo, earned a perfect score at the U.S. Grand Prix stop with the first-ever back-to-back 1080s landed by a woman in competition and then finished in the top spot at the Burton U.S. Open by doing it again. Her accomplishments at this stage in her career are massive, but at her core, Kim is a teenage girl that lives a fairly overwhelming life. One that can sometimes be lost in all of the travel, success, vibrant smiles and consistently impeccable snowboarding. She handles it well, but in a recent conversation with SI.com, Kim allowed a little bit of that desire for a normal life to come to the surface. Ryan Wallerson: I know you also won an X Games gold medal in Oslo, but I want to talk about Aspen, where you successfully defended your gold medal by winning your second. Can you compare your two Aspen experiences for me? I feel like both will be memorable, but for different reasons. The first one in Aspen was a dream—my first X Games gold medal. I don’t think anyone forgets that. This year though, I was really happy to win in a less crazy way than I did the first time, so for that it’ll always have a place in my heart. The second one was also super memorable because I was able to put down a good run on a snowy day. Being able to do it in the snow made that memory a lot stronger. RW: You’ve had great success over the last couple seasons, but you’ve also taken some heavy spills right before major competition in both seasons. Which spill was worse, the fall before the 2015 X Games or 2016 Burton U.S. Open? CK: Thanks for reminding me! Up until that fall [in the Burton semis], nothing crazy had happened to me this season. I was trying to keep my face less scraped up this year, but you can see, I messed my chin up pretty good. The fall from last year was on the last run of practice before the event. I don’t know what it is about it. They were each worse in their own ways. I think last year hurt a little more but I had more time to feel the effect of this year’s fall between when it happened and the final. RW: Did coming back to win both events after those falls help with the pain? CK: Definitely. It always hurts less when you win, but I need to find a better good luck charm. RW: As you begin to come into your own as a rider, do you feel you naturally favor the technical or stylistic side of halfpipe riding? CK: I think the goal is always to be both. I put more effort into the technical side of my riding, but style is very important nowadays. We all know that. You put down a perfect score at the U.S. Grand Prix stop in Mammoth with a run that featured the first ever back-to-back 1080s by a woman in an event. When did you decide that you were going to go for it? CK: That definitely was not the plan coming into the competition. It wasn’t what I was working on in practice; I originally had decided that I didn’t want to go for the back-to-back 1080s on that trip because I felt like it was a little much. I remember the day of the event, I noticed that the pipe conditions were really good, but I didn’t have the thought to try it until right before my second contest run. I’d put down a really good first run, so I knew I had two shots at it and kind of said “why not?” and went for it. RW: Kelly Clark was the first person to greet you at the bottom of that run. Talk about the relationship since you’ve started winning. Our relationship has been the same since I started landing runs as it was before the podiums. She’s always been my number one inspiration, and that isn’t going to change regardless of where I end up in a finals. Things really haven’t changed. I’m progressing as a rider, she still is as well. I’m really happy that we get to share this part of our careers together. RW: Last year, you won gold over her at X Games, but she bested you at a few different competitions. This season, you’ve been pretty unbeatable. How do you view this process of claiming the top spots at all of these events? CK: I absolutely don’t view it as some kind of battle. I don’t go into any contest thinking I have to do better than Kelly or anyone else. Personally, I really don’t like that mindset. I just go into a contest looking to put down a good run. As long as I feel like I’ve done what I came to do and I’m happy with my riding, where I end up doesn’t matter that much to me. RW: How does the view from the top of the snowboarding world compare to your wildest dreams when you got started? CK: When I started, all of this was the dream, but I can’t say that it was a very realistic one until pretty recently. Honestly, I didn’t like snowboarding when I was a little girl. As I got older, it became something I did with my dad. When I was 10, I knew I was good for my age, but I never felt that I was prodigy-level or anything like that. So I can’t say my wildest dreams were anything like how it’s turned out. RW: When was the “pinch me” moment when it dawned on you that all of this was possible? CK: Honestly, I was always considered good for my age but I didn’t really see it until I was 13. When I placed second at the Burton New Zealand Open, that’s probably when it really hit me what I had a chance to do. Then I got third at Dew Tour, second at X Games; I was super consistent, landing on every podium that year . Then, obviously things really took off that next season. RW: In a calendar year, how much time do you spend riding these days and how much downtime do you get away from the slopes? CK: I ride a lot. Like, a lot a lot. I can’t even put it into days because I lose count so easily. Throughout this contest, I’ve found myself wishing I were at home. I love this contest, but I got to go home for a few hours after Oslo and it felt so, so nice to lie on my own couch and in my own bed. I’m not complaining. I love being here, but home has that special feeling. I miss it. I miss Kiwi [my bird]. I miss a lot of things. RW: Can you describe to me what a perfect day for you would be right now? CK: A perfect day for me right now is probably a boring day for everyone else. Sleeping until I wake up, for sure. I can’t control my sleep at all anymore. I’m so badly jet-lagged that I just sleep when I’m tired and wake up when the alarm goes off. Breakfast at a good brunch place with my family because I don’t have any friends in L.A. Just hanging out, shopping, doing my hair, not worrying about snowboarding or school, which basically run my life. Just the normal teenage life would be really nice for a day. RW: Looking forward to the Olympics, how significant for you personally would it be to compete in your first Olympics in your parent’s homeland of South Korea? CK: Just going to the Olympics would be a dream come true. I could finish last and it would still be an amazing experience. It’s been a dream since I started riding and I know it’d be huge for my parents as well. But at the same time I can’t afford to get my hopes too high. It’s so far away and so much can happen in a couple years. We’ll see what happens, but that is something I’m really excited to experience.